Trip Update--First day in Zambia! I know we are a day late on posting this blog, but we are just now getting internet here… there is lots to tell you all about, so here we go! Yesterday was a day we will remember for the rest of our lives. It was filled with an overwhelming amount of joy, praise, hope, and lots of love. After 2 long plane flights with not much sleep, and a layover in London that allowed us to do a bike tour throughout the city, we touched down in Lusaka at 6:30am. Our team of 23 people stood on the runway, and watched the sunrise over Zambia before entering the airport & going through customs. Having our closest friends & family here with us truly made this place feel like home. Anticipation filled our hearts as we waited in the customs line—our team looking like a bunch of ragged travelers who had no sleep or showers in days. For those who were making their first trip to Africa, there was probably a bit of anxiousness for what they would see when they stepped outside the airport onto Zambian soil. For those of us who have been here before, there’s no other way to explain the feeling we had except for the verse in Psalm 23, “my cup runneth over.” When you feel the calling of the Lord so present in your life—like you are living out exactly what He made you to do—there is an overwhelming sense of peace and joy. We had packed 38 bags of donation items, so attempting to track them down was an experience, to say the least. It’s actually a miracle that only 5 of our bags got lost along the way. Anna is the trooper of the group. 4 out of the 5 bags lost were donation bags, but the last one was her personal bag with all her clothes. As we say here all the time: T.I.A. (this is Africa). Going with the flow is crucial here. The Arise Africa staff was there to greet us with “Muli Bwangi’s” and hugs. The greatest surprise was seeing Peter, Brian, Armond & Andrew, the 4 boys who now live at the orphanage, waiting to help us with our bags & welcome us to Zambia! They were shy at first, but quickly warmed up with hugs & smiles! We made our way to our lodge to unload, shower & take quick naps. 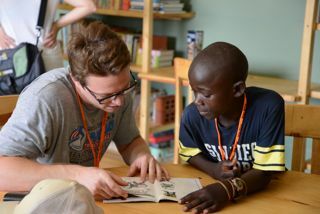 Clayton & I could hardly rest our eyes, as we knew what we would be doing next—visiting the orphanage for the first time. We loaded into a big blue bus and Alissa, director of Arise Africa, gave us a tour through the nearby village. She wanted to show us the type of environment where the kids who now live in the orphanage came from. I pray I am never calloused to the poverty I see here, but it helps to see it through the eyes of those seeing it for the first time. Our bus was silent as we drove through the slums of Lusaka. Children are running around everywhere. Children with babies slung on their back, all walking around barefoot, and squealing when they saw a bus full of “muzungus” (white people). We drove through the market place where we saw everything from chickens & coal, to old shoes & car parts being sold. Amazing to think that only 2 weeks ago, the children who now live in Hope’s Home, lived ther, on the streets, fending for themselves. After an eye opening experience of driving through the compound, we were finally driving down the road to the orphange. My heart was beating out of my chest as I saw the red roof of the house—a place that only a year ago was a plot of land we stood on & prayed over. As we pulled through the gate, we heard children laughing and singing, all waiving to us and banging on the side of the buses. From my seat, I saw Alliness’ smile that is larger than Lusaka. We saw the 4 boys who graciously welcomed us at the airport, and we saw Dorothy & Nelly hugging each other, and giggling uncontrollably. I got off the bus, and out of nowhere, heard a squeal and saw Hope flying into my arms. Reunited at last! Our prayers were answered—here was our healthy Hope, living in a home built for children just like her—kids who need a chance at life and to be loved like every child should. We warned our group about something before they traveled with us to Zambia…the first time you hug a Zambian orphan, your life will never be the same. All the sudden, this massive blanket of poverty, becomes very personal & tangible. We took turns hugging all 8 kids, and telling them how great is was to FINALLY meet them! For the next 5 hours, we got tours of the home. They showed us their beds—which were the first ones they had ever slept in. They showed us the garden that allows them to plant their own fruits & vegetables. We sat around the long wooden table they all sit around 3 times a day to bless their meal, give thanks, and eat as a family. The home is simple, and warm, and filled with children’s laughter and loving house moms. Lucy, Jennifer and Dialles are the 3 house mom’s who truly love the kids as their own. They pull them aside individually to give them the attention they need, and wrap their arms around them as any mother would. Merry Christmas from the home!